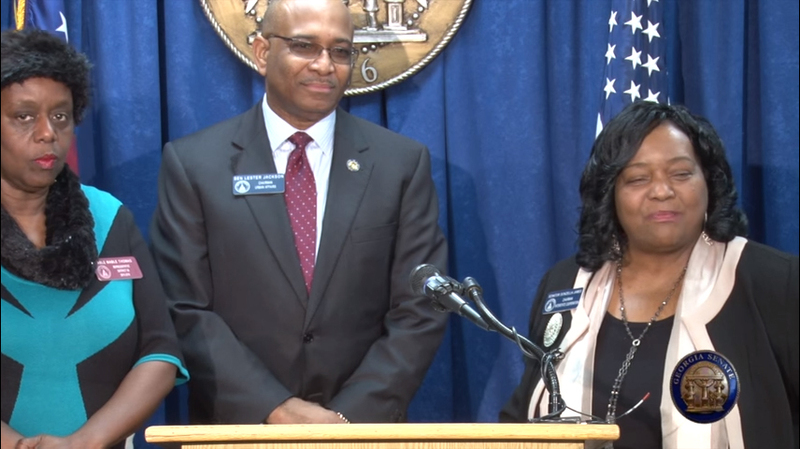 In a 16-minute Capitol press conference, Democrats from the House and Senate rallied around Donzella James' bid to re-name a 5-mile stretch of highway in south Fulton County after controversial pastor Creflo Dollar. "I come in support of the resolution based upon Proverbs 3 and 27," state Representative "Able" Mable Thomas (D - Atlanta) said. "Do not withhold good from those to whom it is due when it is within your power to act. "It is within the power of the state representative that's from that area to act upon the things that she thinks is worthy." State Senator Lester Jackson, a Savannah Democrat, echoed the words of Rep. Thomas. "This street we're recognizing," Jackson said, "is a value, not to the church, but to the people of this great state. "We're taking time to recognize people who have given their service beyond their church walls; but have gone out into the community; have gone out nationally to talk about God's word, and we don't talk about God's word enough." In response to inquiries from reporters gathered at press availability, Senator Donzella James blamed the almost visceral reaction against her Creflo Dollar bill on the media misinforming the public. "I think that the people who are complaining may just be misformed," James said. "They've gotten half-truths and innuendos and misinformation continuously." James also questioned the validity of an online petition that's garnered more than 1,200 signatures against re-naming Old National Highway in honor of Creflo Dollar. "I've not seen a petition, but I tell you I can get more than a thousand people," James said. "If you look at all the calls I've been receiving, the emails, the social media, I can match ours with those petitions. "And those petitions would have to be vetted. The calls I'm getting are from my constituents who asked me to do something to honor World Changers." Creflo Dollar is the founder and pastor of World Changers Church International, located in College Park, Georgia. Dollar is one of the leading proponents of the so-called prosperity gospel; a belief that if an individual gives to the church and believes in God's blessings, they will receive wealth and financial security. Senate Resolution 805, the aptly named Creflo Dollar bill, currently sits in the Senate Committee on Transportation.